Bert passed away last week at the age of 11. He was diagnosed with lymphoma a few days earlier. We picked up two kittens from the animal shelter last week. They were 3 and 4 weeks old when we got them, and we'll keep them until they're about 8 weeks old and ready for neutering + adoption. Oliver (shown here) had a couple of baths in the first week, but quickly learned how to clean himself to avoid the pain. Nibbler is a little camera shy but we'll post some photos of him over the next few weeks. 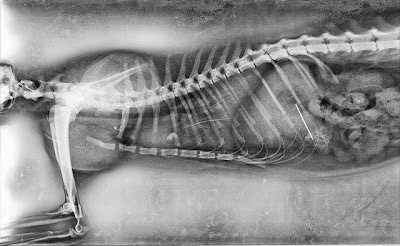 We finally got around to scanning Sherlock's x-ray. Enjoy. Happy investing in index funds! A few months ago we had an adventure with our cat Sherlock. It was Saturday night and we were sitting on the couch when we saw him trying to swallow something on the floor. It was taking him awhile so we rushed over and tried to grab it out of his mouth. He's pretty persistent though and he managed to get it down his throat before we could grab it. Earlier C had been at the kitchen table sewing a button (it was a pretty slow night). When we looked at the table again we realized that the needle was missing. There was a tiny piece of string on the needle, which probably looked pretty tasty to a cat. After tearing the house apart looking for it we couldn't rule out the possibility that Sherlock had eaten it, so we rushed him off to the nearby emergency vet. Once we got there, they took an x-ray of the little guy and sure enough he had the needle in his stomach. Cat stomachs aren't very big and sewing needles are. The veterinarian said that we had three options: feed him lots of fiber and hope that he passes it safely, remove it using endoscopy, or if all else failed remove it surgically. Saturday night is not the best time to have your cat swallow a needle, but the vet called around and found an endoscopy specialist veterinarian in Capitola and we decided to go for the second option in order to avoid turning his intestines into a pin cushion. We got down there at around 11:30. The veterinarian there was finishing up another endoscopy (dog swallowed an earring) and we would be up next. They take Sherlock and prepare him for surgery a little bit before Dr. Hendee comes out to talk with us. It turns out that that bit of string is pretty key because a needle gets rather slippery in stomach juices. It seems like it should be a pretty straightforward procedure so we're hopeful. They put him under and after about 15 minutes start the endoscopy. Ten minutes later Dr. Hendee comes out with the sewing needle and Sherlock is supposed to wake up in about 30 more minutes. 45 minutes go by and no sign up anybody. After an hour the technician comes out to and describes Sherlock as on a bad drug trip, throwing his body around the cage and generally freaking out. A little bit later Dr. Hendee comes out and says that Sherlock they had to give him some valium in order to sedate him and eliminate the convulsions. They're going to need to keep him overnight so C and I head home at around 2am and plan to call them in the morning. The next morning we get ready to call the vet and see that there's a voicemail on my phone, which we weren't expecting. We call them back and find out that Sherlock isn't moving anymore and they're afraid that he has brain damage from the anesthesia procedure. Possible reasons include the breathing tube not getting oxygen to him effectively or a minor stroke induced by the anesthetic. Luckily his vitals are still stable. His gag and eye dilation reflexes are gone and they have him on steroids to reduce any brain swelling. Commence freaking the hell out. We're frantic and drive down there immediately. Dr. Hendee has seen animals like this before and although some have improved, most have not. When we go in to see Sherlock he's in the ICU in a high oxygen baby box. They have an IV in him for fluids and he is laying on his side under a blanket. His eyes are glazed over and doesn't respond to anything, except when his body convulses once every few minutes. Brain dead was a pretty good description. After petting him for awhile we leave and decide to wait around for four hours to see if he improves. When we come back he hasn't improved although he hasn't worsened either and his vitals are still stable. We drive home and can't think of anything but our little boy. We get a call that night from Dr. Hendee who finally has some good news. Sherlock is eating food! Luckily he is obsessed with wet food. He drastically improved within hours and was able to feel hungry, see, smell and swallow food. We're ecstatic and have some hope at last. Monday morning we get another call and Sherlock is doing slightly better. He can move his legs and was able to drag himself around the box to go to the bathroom on his own. He's eating and drinking on his own and they'll hopefully be able to take him off of the IV soon. We say great and after a long day head down to visit him a little after it gets dark. It turns out that they require appointments to visit animals usually and we wait for awhile before we're sent to a waiting room for Dr. Hendee to go see Sherlock in the ICU again. She comes in with a kitten in a blanket on her shoulder! We pet him while he meowed like crazy and ate some wet food. After rubbing his belly for awhile he passed out and we left after about an hour with him. All of his legs are working and he was able to drag himself around a bit although he had a bit of valium in his system and was pretty lethargic. The next day we get a call that we can pick him up. At the office he can walk around except he acts like he's had a few too many drinks and falls over. When we bring him home, his brother Bert doesn't quite know what to make of him so he runs and hides under the couch. When Sherlock tried to get up on the couch he tipped over and couldn't make it into any raised objects. This was a major problem, so we cleared everything out of our bedroom and stuck in the living room and closed the cats in there for the next three days while we slept in the living room. After a few days he kept on improving and before long was normal. Giving him liquid anti-seizure medication twice a day for a month really sucked but we made it. Always get pills. The veterinarian who took care of him was incredible and she was by his side day and night. Without Dr. Hendee he (and we) wouldn't have made it and she really cared about him. The flea medicine business is kind've funny. Medicine for your 10 pound cat costs as much as for your 150 pound wildabeast even though the only difference is the volume of the dose. Here's the info on Frontline plus for the dog medicine. So what we do is buy the big dog dose, transfer it to a small glass bottle and store it in the fridge. When it's time to give the cats their medicine we use a syringe (no needle!) to dispense the medicine. For two cats at 0.5 ml per dose, 4.5 ml will last 5 months, so you're talking about $1 per dose rather than $10 per dose. Our cat sherlock had an endoscopy to remove a needle that he swallowed. It was performed in Capitola, CA at Pacific Veterinary Specialists Emergency Services on a Saturday night and cost about $1000. In July 2007 Sherlock started having trouble urinating and we saw that he had blood in his urine. We took him to Adobe Pet Hospital because they were nearby and had drop-in appointments. They had to insert a catheter and kept him for two nights. The overall cost was about $1300. Overall it was pretty poor service and it didn't seem like the veterinarians or staff cared about how our cat did. It was in stark contrast with our previous encounter at PVES (see above). I wouldn't go there again. Later in July, Sherlock had serious trouble going to the bathroom again. They weren't able to get the catheter in because it was so clogged, so he ended up going into surgery (perineal urethrostomy) to open up his urethra. The surgery went great and he has been doing really well since. It was expensive, but it worked out to be close to the same cost of the prior hospital stays when he had to have a catheter (~$3000) and the fact that he can go to the bathroom is infinitely worth it. We take Lola (our dog) to Klub K9 Pet Center in Sunnyvale and highly recommend it. It's a little over $20/day if you buy a 20-pack, otherwise it's about $40 per day. Their staff is great, they have four huge play areas for the dogs, and they do cage-free boarding. Entries (RSS) and Comments (RSS). 29 queries in 0.535 seconds.